Hi, I am interested in your 1977 Toyota Land Cruiser (stock #19GKM38) listed on Autotrader for $27,500. I'd like to get more information about this vehicle and confirm its availability. Tastefully modified - 350ci V8/4 speed manual gearbox - 4 Skyjacker lift - New top and upper doors - Power Steering and Brakes - Rollbar - (Please note: If you happen to be viewing this vehicle on a website other than our main website, its possible that only some of our many photographs of this car are presented due to website limitations. To be sure you access all the photographs, please go to our main website: Garage Kept Motors.) 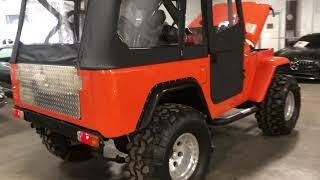 1977 Toyota Land Cruiser FJ40 Garage Kept Motors is pleased to offer this classic Toyota SUV that could be the most fun youve had behind the wheel. This tastefully customized 1977 Toyota Land Cruiser FJ40 has a lot to offer and youll get thumbs up wherever you go. A great driving experience, guaranteed. The truck was painted Orange with aftermarket front bucket seats and rear bench fitted. It is powered by a SBC 350ci V8 with Edelbrock top-end components, mated to a 4-Speed floor-shifted manual gearbox. Other noteworthy features include a brand new BestTop fully removable soft top and doors, power steering, power brakes, roll bar, 4-inch Skyjacker lift, 35-inch Super Swamper tires, Alloy wheels, custom bumper and running boards. The truck fires on command and is offered turn-key. This is a fun classic FJ at a very reasonable price. Cruise to the beach or through the canyon in style. Be sure to check out all the photos and video on our main website: Garage Kept Motors. Call if interested or e-mail with any questions. Thank you for looking.